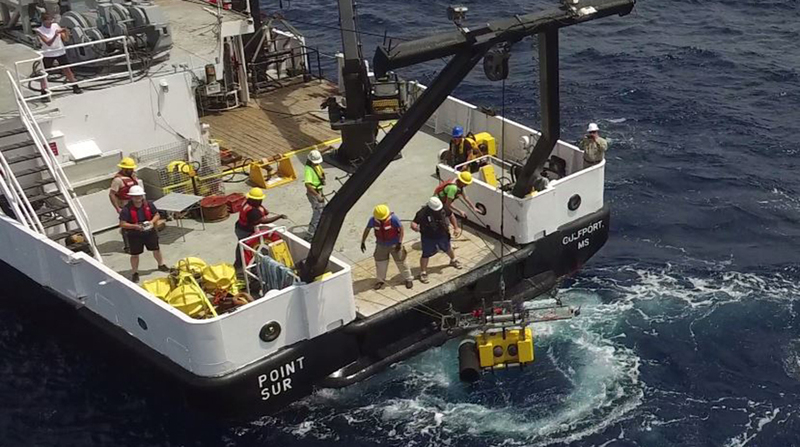 Mini-lander being deployed off the back of the R/V Point Sur, using the new lander-launcher system. Photo courtesy of Justin Blancher. In spite of moderate winds and seas, participants in the spring ECOGIG mooring and lander cruise (led by ECOGIG team member Vernon Asper) accomplished nearly all of their cruise goals. Mooring cruises happen once in the spring and once in the fall and include the recovery, repair, and re-deployment of a mooring at three sites (two in the spring and one in the fall). These sites were chosen by ECOGIG researchers to include a site impacted by the Deepwater Horizon accident, one dominated by a natural oil and gas seep and a control site. Researchers have been monitoring all of these sites since ECOGIG started, and several researchers worked at these sites for quite a few years prior to the start of ECOGIG. The moorings at the two sites visited on this cruise currently have sediment traps, a current meter, and a camera-equipped sediment trap (for measuring particle sinking speeds) attached to them. ECOGIG scientists want to know how rapidly material moves from the surface to the sea floor and how long it takes marine snow to reach the bottom. This will help them understand the amount of time it could take to get particles to the bottom and how easy it is for currents to move them long distances. ECOGIG scientists are always working to better understand the physical and chemical systems that determine the make up of the sediments and the process that connects the sediments to the sea surface. Three mini-landers were deployed at a separate site using the new lander-launcher system developed by Develogic for ECOGIG research. This new system has cameras on board, as well as a USBL navigation system, so ECOGIG scientists know exactly where it is and they can see the seafloor under it. When they get it to the perfect spot, they tell it to detach from the lander, allowing it to fall to the bottom exactly where they want it. This portion of the cruise also went extremely well, with each of the landers being placed within a few meters of the target locations. The third objective was to collect vertical profiles of marine snow abundance using a digital camera system. Four profiles from the sea surface to the seafloor were collected at three sites, in order to figure out the differences in space and time in the concentrations of the marine snow. ECOGIG scientists pair this information with data from the sediment traps and particle sinking speed measurements to develop an understanding of how the entire system functions (transport of material from the sea surface to the sea floor). Next on the schedule is a cruise led by ECOGIG team member Arne Diercks on which the three mini-landers will be recovered and redeployed.